With a cold, wet March, the spring crops have been slow to be put in, and consequently there have been few pest concerns. However, this will change with the onset of temperatures nudging 60⁰ F and drier conditions. There is always the question of how well did the insects survive the winter. This year insect survivorship is probably about average. We had frozen topsoil, but without snow cover, some of the more susceptible insects, like corn earworm, probably didn’t fare well. Temperatures have been moderating gradually and this will help survivorship. A few springs ago we had a rollercoaster of three or four warm days followed by three or four days of sharply colder, freezing weather. That repeating pattern was hard on overwintering insects. The early spring insect pests include root maggots, wireworms, flea beetles, and aphids. Several of these pests are favored by cool temperatures and moist soil. Slow growing conditions for vegetable and row crops favor those insects that feed on seeds and seedlings or young transplants. In the case of wireworms, the theory is that they are actually predators but cool, moist soil deprives them of prey and so they feed on seeds and seedlings. 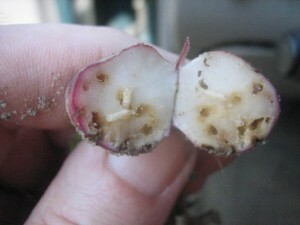 Onion maggot, cabbage maggot and seed corn maggot all prefer cool temperatures around 60⁰ to 70⁰ and wet soils. These flies become active around the time that the mustard weed, yellow rocket is in bloom. Treated seed should be used when possible, especially for onion maggot and seed corn maggot control. All crucifers require insecticidal treatment either in the greenhouse before transplanting or just before, at, or just after planting to prevent cabbage maggot infestations. Once any of these root maggots have become established foliar applications of insecticides to control them may be ineffective and significant yield loss may occur. Wireworms are a sporadic, but potential threat to any crop but usually they are the most threatening to larger seeded crops, such as sweet corn. Seed treatments work well to prevent seed damage with low to moderate wireworm populations. The early flush of overwintering crop growth should be checked closely for aphids. Aphids have a surprisingly low temperature threshold for development – green peach aphid’s is 39⁰. When the air temperatures exceed 39⁰, overwintering aphids begin to move about and feed. As soon as temperatures break and we get our first 60⁰ plus days, aphid populations will be poised to take off.